WARSAW, Ind. – When fans arrived at the Class 2A Warsaw Girls Semi-State Saturday afternoon, no one had a clue of what they were about to witness. With parochial power Fort Wayne Bishop Luers playing – a six-time state champion that was looking for a fourth consecutive state finals berth – most assumed they would simply win by showing up against little-known Eastern of Greentown. When the dust settled on a record-setting game, even the fans of Bishop Luers stood and applauded what is now the single best Final Four performance in the 38-year history of the IHSAA Girls Basketball Tournament. The scouting reports told the Lady Knights to keep an eye on Brittany Neeley, Eastern’s all-time scoring queen. Call it a failed mission. Brittany, a 5-6 guard, dominated Bishop Luers with a 48 point, 20 rebound performance as No. 6 Eastern defeated No. 14 Bishop Luers 74-55 to earn a berth against top-ranked Evansville Mater Dei in next Saturday’s championship game in Terre Haute. When twin sister Bethany’s 16 point, 12 rebound game is added in, the Neeley twins combined to scorch the Lady Knights for 64 points and 32 rebounds. According to the IHSAA, Brittany’s 48 Final Four points’ tops the 47 Final Four points scored by New Albany’s Kennitra Johnson in the 1999 semi-state championship game. In overall tournament play, Neeley is now tied for fourth behind Cloversale’s Ann Hutcheson (60 points, 1988 sectional first round), South Central’s Rachel Dixon (54, 2003 regional championship), Wawasee’s Shanna Zolman (50, 2001 sectional championship) and Hutcheson (48, 1988 sectional semi-final). The Lady Comets entered the semi-state as the underdog, despite the higher coaches poll ranking. One respected Indiana high school basketball website picked Luers to win 55-47. But the Lady Comets are over-achievers and proven winners. And once they snagged the lead four minutes into the game, they never looked back. Bishop Luers scored 26 seconds into the game on a bucket by Tashayla Sutorius. She was fouled by Bethany and the Lady Knights led 3-0. Eastern’s Taylor Holliday scored inside to trim the lead to 3-2 and Bethany gave the Comets its first lead 4-3. Brittany scored on the inside to increase the lead to 6-3, but buckets from Addie Reimbold and Emma Wolfe gave the lead back to Luers. Bethany got inside the Luers defense mid-way through the first quarter, hit a short jumper, and gave the Comets an 8-7 lead – a lead they would hold through the final buzzer. Dexter said he made a defensive switch in the first quarter, moving 6-0 Taylor Holliday to guard Sutorius, Luers 5-11 leading scorer (12.5 points per game). The move worked as the freshman ended the game with just eight more points on 3 of 10 shooting once Holliday took over defensive duties. Luers stayed with the Comets throughout the second quarter, but Brittany hit four free throws in the final 42 second to give Eastern a 29-20 lead at the half. In the third, a bucket from Taya Andrews trimmed Eastern’s lead to 38-34, and the Luers fans started to get excited. But a 10-4 Eastern run – led by six points from Brittany – gave Eastern a 48-38 lead after three. Reimbold started the fourth quarter with a driving layup to cut the lead back to seven – the closest the Lady Knights would be the rest of the game. Brittany hit a 3-point play, Ally Oyler dropped in two free throws, and when Brittany pulled up and hit nothing but net on a 3-pointer, someone in the crowd yelled, “Dagger!” In the blink of an eye (and 62 seconds on the clock), Eastern took an eight point lead to 14 and seemingly cruised to the 19-point victory. Holliday finished with six points and 10 rebounds, and Oyler added a pair of steals to her defensive efforts. Wolfe and Reimbold led Bishop Luers with 13 points. Ask any coach, and they will say that games are won with defense, rebounding and solid fundamentals. Eastern won the battle of the boards 53-32 and hit 15 of 17 fourth quarter free throws. Brittany led the way by draining 19 of 21 freebies, including 10 of 11 in the crucial final four minutes. For the second straight Saturday afternoon, it appeared as if the entire eastern half of Howard County traveled to see the Lady Comets in action. Clad in neon green regional championship shirts, more than 1,500 Eastern fans packed the Comets section of Warsaw’s Tiger Den to cheer the team to victory. The Comets (22-3) took the weekend to celebrate, but on Monday they were back to work – and the road to a championship does not get any easier. Up next for the Lady Comets is the defending Class 2A state champions and No. 1-ranked Evansville Mater Dei (27-2). The game is set to tip at approximately 12:45 p.m., following the Class 1A title tilt. Gates to the Hulman Center in Terre Haute will open at 9:30 a.m. Tickets to the girls state finals are $15 and will be available to the general public in the Eastern High School athletic office on Wednesday. Athletic Director Brad Wilson anticipates receiving 1,500 tickets. 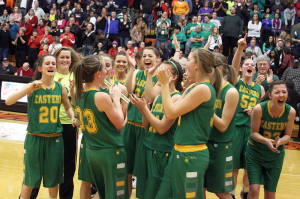 The Lady Comets have proved they belong on the state stage, and no matter what happens Saturday, Greentown will be proud. But no matter what, don’t count this group of young ladies out – they very well could be bringing home a state championship trophy to Howard County Saturday night.